The webAF Middleware Server uses a technique known as funneling, a process that daisy-chains method calls through Java middleware. Using more common Internet terminology, funneling means making multiple hops from the client to reach the server, with each of the hops points having possible computational intelligence. There are only a few advantages, but they are quite important. Reduced memory consumption on the server with reuse of fewer SAS sessions, often one. Faster client startup since a server SAS session does not have to be created for subsequent clients. Information exchange between clients since common trap point is one server session. The clients can intercepts calls both at the client point and at the middleware point for filtering. 1 Windows NT Web server which is also the SAS server. For explanation and comparison purposes, two identical web pages are created in webAF with a TreeView containing a LibraryList. One will be funneled, one not. In both cases fixed, costs, such as running a Web Server, will be ignored. For 10 users this gives a total memory cost of 15 Meg. For a total cost of 101 Meg, for example, 6 times less memory is used when funneling with 10 users. And the costs savings scale linearly, for a hundred users against a single server the savings escalate to nearly 1000 Meg. However, this is not without its disadvantages to be discussed in the next section. Small decrease in performance for a single client. Geometric decrease in based on number of clients as they block each other. Server space is unprotected for libname or macro collisions, only SCL lists and objects are protected. SAS/CONNECT for Java's throughput on Windows NT using TCP/IP sockets (rather than Tunneling) is approximately 100 methods/second. RMI's throughput on Windows NT using TCP/IP sockets is approximately 680 methods/second on a Pentium II / 266Mhz. In the best case, single client performance is still reduced from 1/100th seconds, 0.01 seconds, for a method call to 1/100 + 1/680 = (100+680)/(100*680) = 0.0114 seconds. For an application that is now 11 times slower. This table only applies to worst case concurrent response time, that is, if the users either pressed a key simultaneously or before the server had serviced the last request queuing up subsequent requests. Memory remains fairly constant. If the requests were staggered then only the 12% response time degradation would be noticed. The implementation of this is currently via RMI for the initial hops with a back-end protocol of either SAS/CONNECT for Java or HTTP-Tunnel, later the initial hops protocol will be changed to be user specifiable. First the applet is loaded on to the local machine's VM, this is either from the Web server or from the local disk. Then, in establishing the connection, the webAF system classes (in webAF.jar), note that funneling is specified for this connection to SAS. Now object creation requests go through the middleware. A script is included with the Web Server installation portion of webAF. On Windows NT, a shortcut is added in the AppDev Studio group named webAF Middleware Server. Selecting this shortcut will start the webAF Middleware Server (sometimes referred to as RocfORB). This application will allow you to specify the maximum number of clients allowed per SAS session on any given host. Once the maximum number of clients has been reached for a SAS session a new SAS session will be started for any subsequent clients. Once that SAS session reaches the maximum number a new SAS session will be started, and so on. If a host is not listed in the administration application an unlimited (up to system resources) number of clients will use a single SAS session on that host. To remove a host from the list simply set the Maximum Clients to 0. 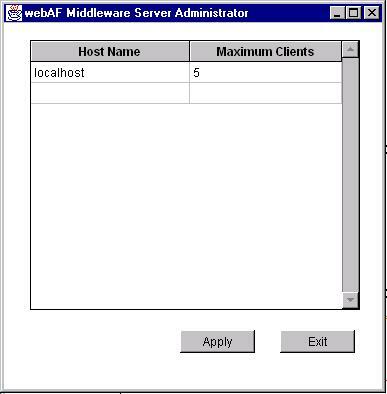 The webAF Middleware Server will reload these settings automatically once the Apply button has been pressed, making the changes take effect immediately. Note that the administration application writes changes to the <AppDev Studio HOME>/Java/SAS/funnel.cfg file. Click Use Funnel to share a SAS session in the ConnectionCustomizer Configuration Tab. This presents a problem when using funneling as middleware depending on the structure of the application, consider using DataWarehouse. The ReturnValueList is always OK, it is the output parameter, so call-by-reference or call-by-value is ok. This has the added benefit of improving performance, as the user would then clearly dictate what gets sent over the wire and what does not.